I love ramen, even the instant kind. But those deep-fried instant ramen, that were part of my staple diet as a uni student, are a poor imitation of the real thing. Fresh ramen, like the ones you get in a ramen bar are a delight. The trouble is that, as a vegan, it is sometimes difficult to find a ramen bar that serves a vegan broth. The answer is to make them. I’ve never done it before, but I am excited that I have. They are pretty easy, particularly if you have a pasta machine. And they are delicious. The secret ingredient in ramen noodles is alkaline water. This is what gives the noodles their slightly chewy texture. To make this you need an alkaline salt. Traditionally this is kansui which is a combination of potassium carbonate & sodium bicarbonate. But, an easy replacement is easily made at home by “cooking” sodium bicarbonate in an oven on a low heat for an hour. This raises the pH of the bicarb making it more alkaline. This is then dissolved in the water used to make the dough. 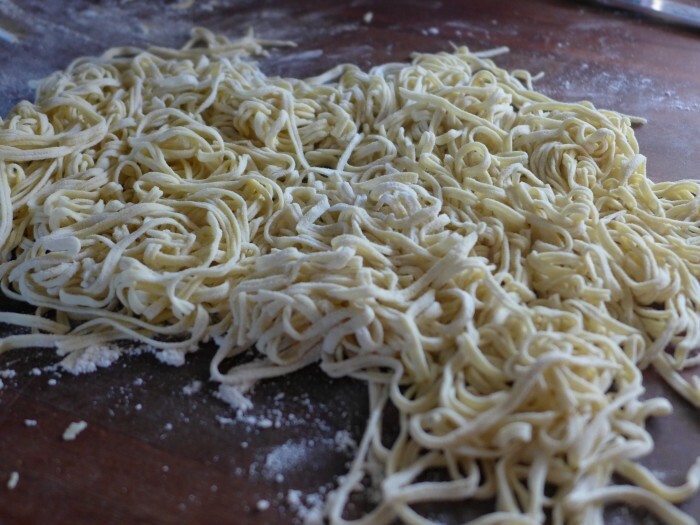 Once you have made the baked bicarb, making the noodles is fast. Another piece of good news is that the noodles can be frozen and used later to make “instant” ramen. There are other recipes out there that cook normal noodles in water with unbaked sodium bicarbonate but they reportedly don’t taste good. So I settled on this more traditional one where alkaline water is used to make the dough. There are a heap of recipes out there. I based this one on a recipe on the New York Times by Harold McGee who is credited with the idea of baking the sodium bicarbonate to make the alkaline salt. Spread the ¼ cup of sodium bicarbonate on a foil or paper lined baking sheet and bake for 1 hour at 120 deg C.
Take 1 tsp of the baked bicarb and store the remainder for later use. Dissolve the 1 tsp of baked bicarb in the warm water. Add the liquid to the flour and mix into a dough. It will be quite dry. Wrap the dough and rest for at least 30 minutes. Roll out thinly and cut into fine noodles. I used a pasta machine to roll and cut the dough. Cook in boiling unsalted water for 1-2 minutes, drain, rinse and use in your favourite recipe. 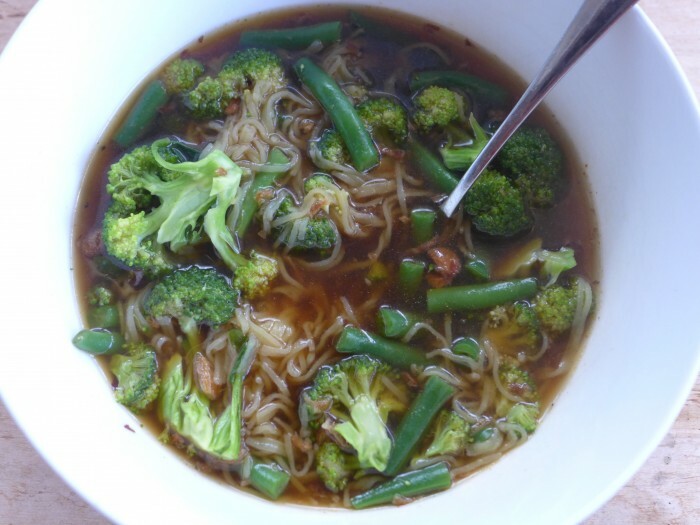 I used the noodles in a soup with green vegetables and a miso and soy broth. I also ate them as a snack with some kecap manis, sriracha, sliced spring onions and sesame oil. So awesome that you made your own ramen noodles, they look really good!